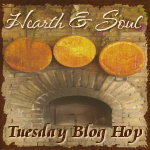 Welcome to the Hearth and Soul Blog Hop, the weekly blog hop for recipes using healthy ingredients, comfort food recipes, articles about healthy living, real / slow / local / sustainable food, foraging, herbal remedies, organics and gardening. Thank you to everyone who visited and shared posts with the hop last week. All posts are shared on Pinterest, either on the hosts’ own boards and/or on our shared board Recipes from Hearth and Soul Hop Contributors. Here are three recipes which caught my eye. Right, on with the Hearth and Soul Hop! Please link back to one of the hop hosts – through text link or a badge – within your linked post. This is mandatory if you wish your post to be considered for a feature. By linking to the hop you are giving permission to feature your properly credited posts and photos here on The 21st Century Housewife as well as on Facebook, Twitter, Google + and Pinterest. Don’t forget to leave a comment so I can be sure to visit your post! And please take a moment to subscribe to my weekly email in the box below the linky / above the comments. Thank you! I found a few really great recipes already. Thanks as always for the party. I brought sweet treats this week: chocolate raspberry cake and some mango and coconut rice. Your recipes look delicious, Diane! I look forward to visiting your posts. What a nice surprise to see my recipe up above. I love it. Thanks for sharing it with others. Today, I am sharing a really nice spinach recipe with cheese and nuts – a great combination. My pleasure, Chaya! And I’m always looking for new spinach recipes so I look forward to seeing yours! Thank you for hosting. Loving all the summer produce links this week.